Hello Everyone! 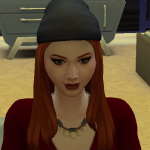 I have been working on a new CC Finds blog to contribute to the sims community. There aren't enough of these kinds of organized blogs out there, so I decided to create my own in the way I like. My blog uses an ellaborate tagging system so you can find things based on: if it has paywalls, what site used to download, creators, themes, etc. I also am working on compiling and organizing cc creators lists so you can go shopping that way. I particularly seek to find and tag cultural things, specifically Black and Asian culture things. Wow! This looks really great! Thank you for putting this together!